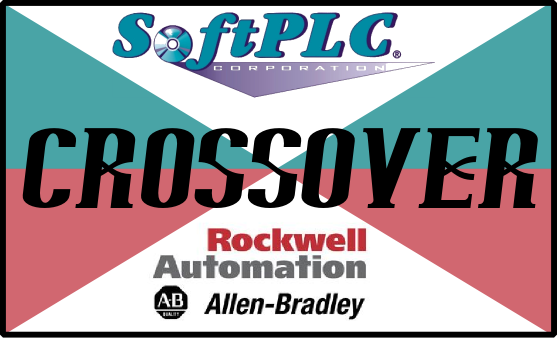 The tables on this page "crossover" the SoftPLC products that can be used for the same purpose as the listed Allen-Bradley or Encompass partner products. These are not drop-in hardware replacements, but products that perform the same function in your control system. If you have an A-B part list and want to see what a SoftPLC based system would require, or if you have an existing A-B system and want to upgrade it, these tables are very useful. Whenever you see this symbol in our store or on the site, it means we offer products equivalent in functionality (usually with more features/lower cost) to Rockwell Automation/Allen-Bradley or Encompass partner product(s). The tables on this page make it easy to find SoftPLC product options to A-B or Encompass Partner products. If you want to take advantage of our migration path from an A-B PLC to SoftPLC and leave the existing I/O in place, the "CPU" tab can help you select the right SoftPLC controller. As part of an upgrade or if you need to add/replace I/O in an existing system, the "I/O" tab is the place to go. For partial migrations, such as upgrading Drives/PanelView on Remote I/O or Data Highway Plus, select the "Comms/Other" tab. If your A-B PLC system uses a now obsolete special communication, coprocessor or specialty module, the "Comms/Other" tab can help. For "drop-in" replacements for PanelView HMI's, select the "HMI" tab. Of course, every product from any vendor is unique and will include a different set of detailed specifications and capabilities. You will need to research the details if your application has strict requirements. Contact us if you have specific questions about the suitability of one of our products for your needs. The table below lists SoftPLC products to interface to A-B network protocols for use in system upgrades/migrations or in place of obsolete interfaces. Contact us if you need assistance in choosing a communications Gateway Bridge or Protocol Converter for your particular application. The table below should be used only as a rough guide to help choose a SoftPLC CPU to replace or be used in lieu of an Allen-Bradley controller. Any SoftPLC, including the Micro SoftPLC, has more memory and computing capacity than the largest A-B controller. Most SoftPLC's have more built-in ports than any A-B controller. Choice of a SoftPLC controller is very application dependent, taking into consideration factors such as quantity/type of I/O, communication requirements, environment, physical space and cost. Contact us if you need assistance in choosing a SoftPLC CPU for your particular application. SoftPLC's Tealware I/O can be used locally with a Smart SoftPLC, or as remote Ethernet ModbusTCP I/O with any controller. The table below indicates which Tealware module can be used in lieu of Allen-Bradley I/O module for the same signal type and approximate number of channels. Note that the Tealware modules are not a hardware replacement to fit into an existing A-B system, the crossover reference is for use in determining the closest functional match that you would purchase as an alternative to A-B products for a SoftPLC system using Tealware I/O. As an open architecture platform, SoftPLC controllers support I/O from hundreds of vendors, we only list our own Tealware brand in this chart. If an A-B module is not listed, the functionality you need may be obtained using another vendor's I/O or firmware function within SoftPLC. Contact us if you need assistance in choosing a SoftPLC CPU and/or I/O for your particular application. * The Tealware module may not have all the characteristics required as an alternative to this A-B module. Check the specifications of both before assuming you can use the Tealware module as an equivalent. The tables below list the components which are used with modules to create complete I/O systems. Note that Tealware bases hold as many I/O modules as the number of slots, whereas A-B racks hold less due to slots reserved for CPU's, adapters, and power supplies. The Tealware components are not a hardware replacement to fit into an existing A-B system, the crossover reference is for use in determining the closest functional match that you would purchase as an alternative to A-B products for a SoftPLC system using Tealware I/O. Contact us if you need assistance in choosing a SoftPLC CPU and/or I/O for your particular application. A chart is available that lists SoftPLC Web Studio HMI "drop-in" crossover replacements for PanelView models. The chart includes cutout comparisons and supported network protocols. Combined with the automated application conversion utility, upgrading old PanelView's is easy. By "drop-in" we mean that the Web Studio HMI will fit into the existing/same panel cut-out as the PanelView model. In almost all cases the Web Studio HMI is slightly larger than the PanelView, so no coverplate would be required, just minor filing/cutting. Where the Web Studio HMI is smaller, the difference is minor. Contact us if you need assistance in choosing product(s) for your PanelView upgrade. Click here for Web Studio HMI product options, details and specifications. Chart of SoftPLC Web Studio equivalent to PanelView models with cutout dimensions comparison. Also includes available drivers, cables for various communication network protocols. Web Studio HMI Overview Generic description of Web Studio HMI products. Web Studio HMI Datasheet Product options, details and specifications.